Wil Hardy II caught all smallmouth last week en route to winning the Northern Open at Oneida Lake. 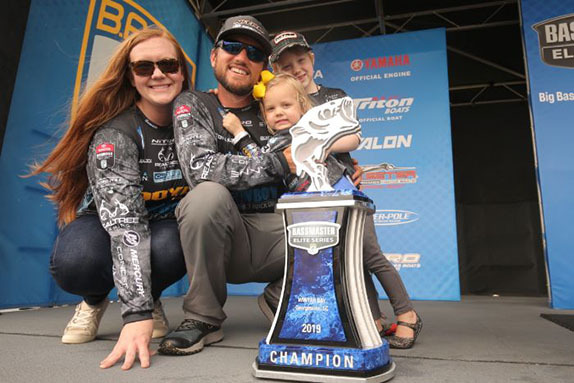 Wil Hardy II came to Oneida Lake for the first Bassmaster Northern Open with a general idea of how he was going to attack the lake. In his previous trips to the Central New York fishery, he�d yet to tap into the largemouth that have been central to past multi-day tournament wins (Ish Monroe, Tommy Biffle and Dean Rojas, for example). Fishing for largemouth at Oneida takes commitment and Hardy, a native Southerner, had other plans last week. With his focus solely on chasing the brown fish, Hardy maximized one area for 3 straight days and came away the surprise winner with a 53-13 total. If he competes in the final two Northern Opens (he plans to), he�ll qualify for the 2017 Bassmaster Classic at Lake Conroe. 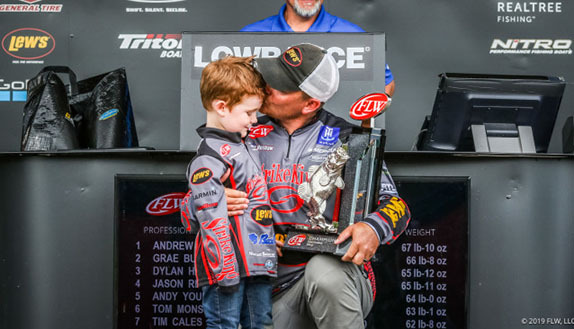 The former FLW Tour pro � he competed 2 full seasons and parts of 2 others � is still soaking up the fact that he topped a field of 200 boats in a region he�s fished sparingly over the years. 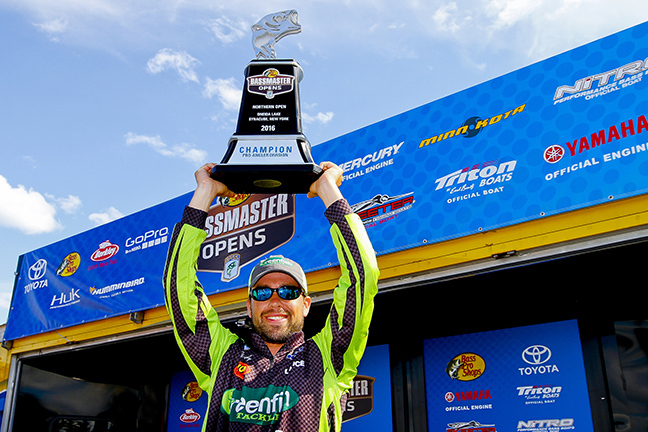 Hardy�s love affair with Northern fisheries can be traced to the 2008 Eastern FLW Series when the circuit visited Lake Champlain, where he competed as a co-angler. He has fished Champlain and Oneida on a handful of occasions since then, but the multi-species options that Northern lakes present has always intrigued him. When he comes up north, his outlook tends to change for the better. By employing two different presentations of a Zoom Speed Craw � a Carolina rig and an Arky-style jighead � Hardy was able to keep the fish interested as he combed a flat in 11 feet of water that had a mix of hard bottom and scattered grass. Here�s how he did it. 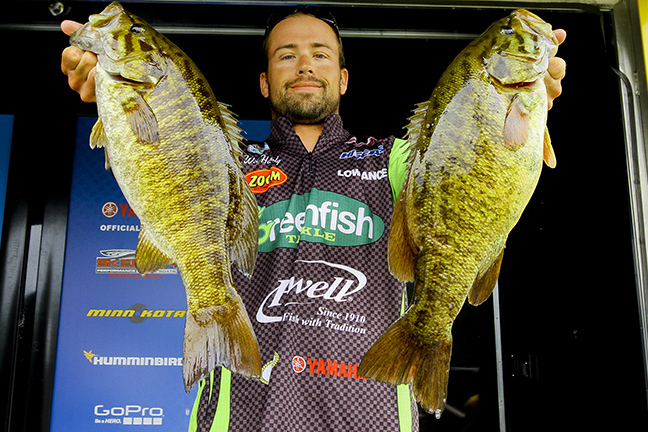 Last August, Hardy finished 26th at the Oneida Northern Open using the same two presentations he used a week ago. �I figured with the month difference and with the fish coming off the spawn a few weeks ago, if I caught them that way a month later (last year), it figured to be better earlier,� he said. He started practice with three rods on his deck � a dropshot, a Carolina-rigged Speed Craw and a Speed Craw rigged on a Greenfish Tackle Creeper head � he returned to the same areas that had produced for him in the past. A local tournament Saturday and the collective impact of 200 boats preparing for the Open changed the atmosphere as the tournament drew closer. But the place he ultimately sat on for 3 tournament days gave up four keepers in 15 minutes and he figured he could start there and get a limit, then hunt around for upgrades. Hardy had his 17-04 in the boat by 9 a.m. on day 1, allowing him to run around to many of the other areas where he found fish during practice. None of them produced � at all. He wasn�t the only one to have found what turned out to be the winning spot. Mike Iaconelli, who finished 6th, also fished there all 3 days, but Hardy said they co-existed in a respectful manner. Hardy had a lower boat number on day 2 and Iaconelli won the race to the area. Hardy said he gave Ike the same respect that was given to him on day 1 and he committed to staying there for the duration. He worked the area hard all morning, but the bite seemed to fade off around 9 a.m. He culled just once after that, but still had 18-05 despite two dead fish. That was enough to put him in the lead entering the final day. Hardy said he caught fewer fish on the final day, but they were all good quality, 3 1/2-pounders, again dragging a Carolina rig or a jighead across the flat. Hardy moved into the lead on day 2 and never looked back, catching 18-pound bags on each of the last 2 days to clinch the win. 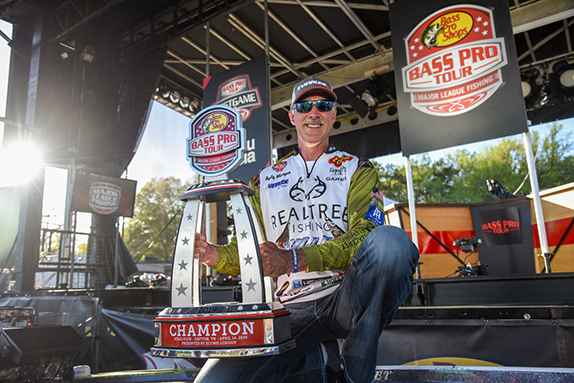 His 18-04 stringer was good enough to salt away a 3-pound, 4-ounce win over Jacob Wheeler. > Hardy said the key elements to the spot he fished were the shell bed surrounded by softball-sized rocks and scattered clumps of grass. > He had his boat positioned over 12 or 13 feet of water and was throwing up to 11. > His retrieve was pretty quick, but he made sure to maintain contact with bottom. He kept his rod tip parallel to the water or pointed down, mostly to keep any line slack out of the wind. > He opted for a Carolina rig as opposed to a finesse presentation because he was able to be more efficient. > Carolina rig gear: 7�3� medium-heavy Powell Max 3D casting rod, Shimano Chronarch Ci4+ casting reel (6.4:1 ratio), 15-pound Hi Seas fluorocarbon line, 1/2-oz. unnamed tungsten weight, unnamed swivel, 3/0 Gamakatsu EWG worm hook, Zoom Speed Craw (green-pumpkin). > Hardy used an 18-inch length of 12-pound fluorocarbon from the swivel to his hook. > Creeper head gear: Same rod, same reel, same line, 3/4-oz. Greenfish Tackle Creeper head, same bait. > The Creeper head is an Arky-style jig head with a corkscrew bait keeper in the head. Hardy stuck with the 3/4-oz. version more because of the breezy conditions. > He caught more than half of his weigh fish on the Carolina rig, but he�d mix in the Creeper head when that bite started to fade.